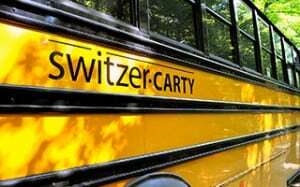 At Switzer-Carty Transportation, we believe that safety and personal security of all the children who are in our care everyday are our first priority. According to Transport Canada, the yellow and black school bus is the safest mode of transportation for school children due to stringent driver eligibility and licensing requirements, high standards of driver training, rigorous daily and periodic vehicle inspection procedures and maintenance obligations, and school bus design and construction affords passengers superb crash protection. School buses are subject to extensive construction and equipment standards, to a much greater extent than any other road vehicle. School buses must meet stringent standards for structural integrity, crash protection, fire retardancy, and emergency equipment. Children sit in specially designed, high-backed and thickly padded seats that cushion them in event of a collision. This “passive” occupant protection system is known as “compartmentalization” and is unique to school buses. Transport Canada is responsible for setting 37 school bus safety standards, including such features as the strengthened steel beams which run the length of a school bus, a steel cage around the fuel tank, the distinctive yellow and black colouring, the overhead flashing lights and stop arm. Transport Canada frequently conducts a series of safety tests to make certain school buses continue to be the safest mode of transportation for children. It is public knowledge that seat belts save lives. However, field data, side impact tests and sled tests have shown that “compartmentalization” minimizes the risk of fatality when riding a school bus. Advances in technology and increased knowledge of occupant protection have provided us with the tools to further optimize protection for all passengers. Compartmentalization is the high-backed, heavily-padded and closely-spaced seating found in all school buses. This built-in passive restraint system protects children the moment they take their seat. This system has proven to be very effective at preventing serious injuries and fatalities for school-aged passengers by absorbing impact. Transport Canada and MTO have confirmed that seat belts on school buses do not offer the same protection to passengers as they do in a car. In fact, seat belts have the potential to cause more serious problems to occur. School buses do not employ the same safety features as other vehicles because they do not have similar crash dynamics. Industry representatives agree that compartmentalization is the best means of protection for the occupants of a school bus. The crossing arm is a visual reminder to students who have to cross the road before boarding or after leaving their bus, to do so at a safe distance away from the front bumper. The closer students are to the front bumper of the bus, the harder it is for the bus driver to see them, or locate them in the bus mirrors. It is important for the bus driver to know that all students are safely clear of the bus before pulling away from a stop. It is also important that students are able to make eye contact with the bus driver, whose view of approaching traffic is better than theirs, to watch for a signal that it is safe to cross the road. The crossing arm is not a barrier. Students are not expected to wait behind the crossing arm as though it was a turnstile or railway grade crossing gate. Traffic safety statistics demonstrate clearly that students are at greatest risk of serious injury as pedestrians around the bus, not as school bus passengers. Use of the pedestrian-student safety crossing arm is no replacement for vigilance on the part of students, school bus drivers, or the motoring public. However, it may prove helpful in reminding everyone to take extra care in the danger zone. In addition to regular mechanical maintenance and daily vehicle inspections by the driver, our Government approved Team performs at least two inspections each year on every school bus in our fleet! Preventative maintenance is what keeps students safe. All school buses are subject to roadside safety inspections. Unlike other kinds of commercial vehicles, they take place at the destination, rather than at the roadside. The inspections are unannounced and are routine checks. The results of the inspection are reported to the drivers, the school bus company and the school board. Every school bus company requires a Commercial Vehicle Operator Registration (CVOR) number. The company’s on-road performance is tracked against it. Strict emission standards for heavy-duty diesel vehicles, the mandatory use of ultra-low-sulphur diesel, as well as periodic government emission testing all contribute to the school bus low environmental impact. To further reduce students’ exposure to school bus emissions, we utilize an anti-idling policy.